This advertisement for the Maybelline Magic Mascara from 1959 really surprised me. FIFTY years ago, Maybelline was promoting a mascara with a new spiral brush. Before the advent of the spiral brush, women were using flat brushes that were similar to a brow brush. It would be rubbed on a pan of mascara wax and then you would apply it to your eyelashes. The process was difficult and the advent of a spiral brush made it much easier. Amy says that the mascara is nice, but the vibration isn’t worth the extra money. Although I like how it looks on the lashes, I do think the vibrating part is completely pointless because I’ve used the Define-A-Lash mascara in the past and it has given me the exact same effect. The vibration is so slight and gentle that I really don’t think it makes that much of a difference… Also you have to be quite patient, because you have to do it so slowly. I would rather get in there and get it done really quickly. 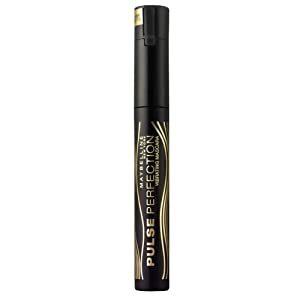 Maybelline has a long history of gadgetry with their makeup and they always have something new for us gadget girls, but it looks like the Pulse Perfection doesn’t quite live up to the original spiral brush on the Magic Mascara fifty years ago.